Follow the step-by-step instructions on growing bottle gourd plant from seeds with information on its flowers, pollination, pruning, pests and diseases and fertilization. Bottle gourd (Lagenaria siceraria) is an annual, vigorous, climbing vine with large leaves and white flowers. It had been cultivated in Asia, Europe and the Americas for thousands of years. It is also known as Opo squash, bottle squash, long Opo, long upo, calabash, Po gua, Pul Qua, and long melon (Chinese melon), yugao, and in India as lauki, dudhi, doodhi, aal or ghiya, Bhim. In Southern Italy, a similar plant is cucuzza, which grows fruits up to 3 feet long! Opo Squash or bottle gourd, sometimes called as a melon, is a squash from cucumber family (how to grow cucumber). It is a squash with smooth skin resembling a large zucchini of yellow green colour. The bottle gourd is an easy to grow plant at home. You can grow it in a pots or in ground starting from bottle gourd seeds or seedlings. Each year you have to grow a new plant as it is an annual plant. The bottle gourd plant grows quite quickly, very vigorously and spread to long distances. All the gourds such as bottle, snake, ridge, bitter, ash, pumpkin, etc, can be grown in similar manner. In 75 days you will be having lots of bottle gourds growing on the vine. The following step-by-step instructions will show you how to grow and take care of your bottle gourd plant. Growing Bottle Gourd in Pot or Ground: Bottle gourd can be grown in ground in your garden or in pot. If you plant lauki in a pot, select a wide and deep pot, at least 50 cm diameter, also you can plant a bottle gourd type that grows very slowly or remains short. If you have only small place to grow bottle gourd, you can grow it in a pot, spread the vine on trellis or roof. If you are growing it on your terrace, then spread the plant on the fencing (the outer wall on the terrace). Last year I put one seed in a pot and another in ground. While the bottle gourd in the pot produced good number of gourds, the one in ground was not very rewarding. The problem with bottle gourd in ground was that it grew to very long distances climbing on to a nearby high tree, from where I could not hand pollinate the bottle gourd flowers. On the other hand, the bottle gourd in the container grew to a manageable distance. Buy lagenaria siceraria gourd seeds from any garden shop or you can use the seeds prepared from last year's crop. When to Plant bottle gourd: Bottle gourd is a summer growing vegetable. Raise the seedlings in a 4 inch pot indoors (growing vegetables from seeds) or in a hot frosts free place (temperature at least 20 deg C) in ground by sowing 2 seeds, half inch deep. Keep the pot moist. In late spring, transfer the bottle goyrd seedling plant to the prepared bed containing compost (composting) and manure. Water regularly. They need plenty of water in the growing season but hate wet feet. When each main vine grows to about 6-8 feet long, cut off the growing tip. This will force the plant to produce side branches that will produce fruit much sooner, more flowers and more fruits. Spray seaweed solution or liquid fertilizer or comfrey tea fertilizer regularly every 3rd week. The plant can grow to over 15 ft, so they need a solid support to climb by the tendrils or trellis along the stem. I made a cross string net between two papaya trees and guided the plant. The leaves of the bottle gourd are up to 15 inches wide and have a velvety texture because of the fine hairs. After about 45 days of planting, both male and female flowers will start to emerge. The plant produces white flowers, up to 4 inches in diameter. The male and female flowers look similar, the males on long peduncles and the females on short ones. You can identify the female flower which has an ovary of the shape of the fruit. Sometimes your bottle gourd plant may have flowers but no fruits. This happened to my bottle gourd vine. I was very sad to see that none of the female flowers were producing fruits, they were dropping without growing into a bottle gourd. This was due to the failure of pollination as there was no bee activity in the garden area. As there were no bees in my garden, I pollinated bottle gourd by hand. If you see that the female flowers of your bottle gourd do not grow and drop down, then you should pollinate them by hand. How to hand pollinate them? When the flowers open, rub a soft brush first in the male flower and then in the female flower. I also got success by just rubbing softly the inside of both the flowers together. You could spray the vine with sugar water to attract bees. Sometimes the bottle gourd vine produces less or no female flowers and no fruits. To increase the flowers, you may cut off the growing ends of the branches when they are about a 3 feet (1 m) long. The new growth will produce more flowers. A fertilizer high in nitrogen produces leaf growth with very less number of flowers. Feed the vine with a fertilizer high in phosphorus and potassium to produce more flowers. 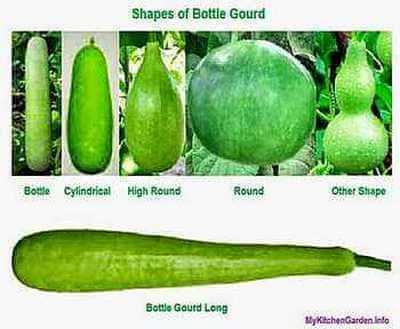 Bottle gourd needs a fertilizer high in phosphorous and potassium than nitrogen. Bottle gourds need nitrogen to grow vigorously, but excess nitrogen will encourage more leaves instead of fruit. A NPK fertilizer with ratio of 6:10:10 or 4:8:5 can be used. Add about 20 g in the soil for each plant before planting. Feed every 2 weeks with a liquid fertilizer or comfrey tea fertilizer. Bottle Gourd plants are quite carefree but they are attacked with same pests that plague cucumbers and pumpkins. Powdery mildew can be a problem in humid hot weather. If mildew develops, remove the affected leaves and water the roots regularly. Cold wet weather can develop grey patches on the leaves. If that happens, remove the infected leaves, and move the shoots far apart for air circulation. Fruit fly: Cover the fruit with polythene or paper bags. Use fruit fly traps as in tomatoes plants. Destroy the affected fruits. You can see white or grey bugs underneath the leaves with several tiny gold eggs and dark brown adult pest on the stems. You can see beetles inside the blossoms in the morning that you can pick by hand. I wanted to grow a very long fruit, so when the gourd started to grow, I just plucked away all new female flowers. This allowed all the food and energy of the plant available to the only one fruit. I also tied a soft poly-tape at the bottom of the fruit and hanged a small weight. This way my bottle gourd reached to a length of 1.23 m and weighing 10 kg. It could have grown even bigger had I not plucked it, if I would have decided to grow it for making seeds. Many of my friends and neighbors had come to see this huge bottle gourd (long melon). It was very difficult for us to consume so much so I distributed it to four of my friends. There are some varieties like New Guinea Beans and Bhim bottle gourd which grow about 3-5 feet long. Bottle gourd makes very healthy and tasty curries like lauki channa dal and lauki kofta curries. A popular north Indian dish is lauki channa dal curry, (channa dal and diced gourd in a semi dry spicy gravy). It can also be used to make bottle gourd halwa. Get all the Questions and Answers on Gourds . If you have any question on bottle gourd, please go to this questions and answers page.